The Eric Andre Show debuts tonight on Cartoon Network at 12:30 a.m. Eastern. The Eric Andre Show, Adult Swim’s new “talk show” (more on the quotes in a moment) begins with the host rushing the stage, destroying a drum set, throwing a ladder at his bookshelf, shoving his hands into raw chickens, pulling out his own teeth, kicking the remains of his desk, and defeatedly sitting down in a chair. Then, Andre’s co-host Hannibal Buress calmly walks on stage and joins him. It’s actually one of the longer bits on The Eric Andre Show, and no less weird than the remainder of the 15-minute première of the latest series from Tim Heidecker and Eric Wareheim’s Abso Lutely Productions. In fact, there’s such a flurry of weirdness, The Eric Andre Show barely has time to catch its breath. In the middle of an interview with Dolph Lundgren, Andre karate chops a birthday cake and shoves it into his mouth. Fake George Clooney (played by Patrick Warburton) performs a vague poem as Andre plays the drums and Buress stands in the background, at one point putting his glasses on the back of his head. The entire episode feels like a fever dream—it’s compelling and fascinating while it’s happening, but once it ends, the details are fuzzy. That’s mostly a byproduct of the manic pacing: most of the jokes soar past without much mention, though occasionally Buress is there to add a quip. Tim And Eric Awesome Show, Great Job! worked really well as a 15-minute program, because it was able to play comedic games using unsettling images/material and leave before completely disturbing the viewer. But The Eric Andre Show feels like two Tim And Eric installments crammed into the space reserved for one. Thus, the already-perplexing show has even less of a through line; the pilot gives the momentary impression that the show will derail completely. Thankfully, the show has a lot of good things going for it that were likely tweaked after the pilot. For one thing, Andre is a truly capable comedian, with a standup persona centered around his absurd take on the mundane. (Buress is a similar performer, though decidedly much more chill; their tastes match up perfectly, even if their stage presences don’t.) And the format of the show fits its star’s sensibilities just right. 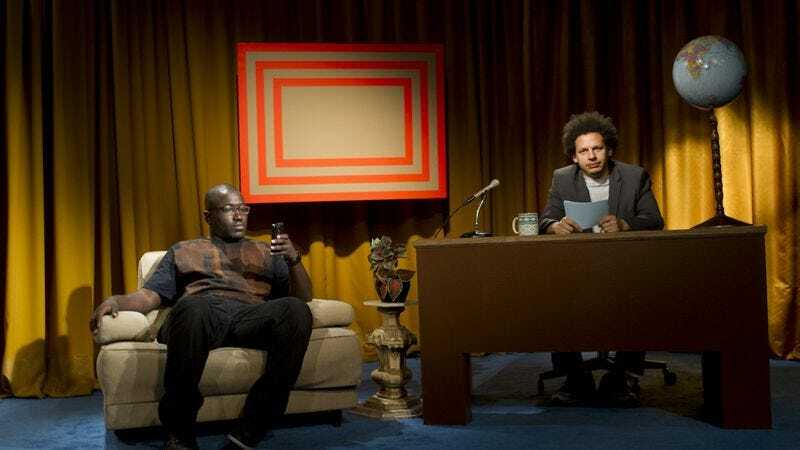 Though The Eric Andre Show bills itself as a talk show, it’s more of a funhouse commentary on the format. Andre delivers monologue jokes that trail off to nowhere. He can barely muster the focus to interview his guests. His pre-taped segments involve him waiting inside a trashcan to startle/surprise passersby. As in his standup, he’s taken something familiar and twisted it past the point of recognizability. Because the pilot is so rapid-fire, it’s not the best representation of Andre. Often, his time on screen is sacrificed for the sake of a joke—or rather, they become the joke. For example, there’s a segment where he and Buress answer questions to avoid having hot coffee thrown in their faces. Andre loses every time, so he flails around like Cosmo Kramer entering Jerry’s apartment as cup after cup of scalding beverage is thrown in his face. That kind of frantic energy follows everything Andre does for the remainder of the episode, whether it’s trying to interview his guests or the aforementioned pastry abuse. He does weird stuff and there’s no time to take it in. There are a few moments of pause in the pilot that stand out. One of the recurring bits involves Andre gently touching strangers’ hands, telling them it’s “Touch A Stranger’s Hand” day, then gauging their reactions. They mostly pull their hands away in disgust. One, however, lets him keep it there for a long, long time. The bit serves as payoff to Andre’s previous, failed attempts, and provides a respite to the maniacal energy of the rest of the show. So, too, does Buress. His deadpan chastising of Andre is a delight; he’s always ready with a wisecrack, and reacts with supreme cool whenever something completely off-the-wall occurs. Following Andre’s epic entrance with Buress’ understated one initiates the pilot with a laugh. There’s a lot to look forward to on The Eric Andre Show. It’s a shame its pilot tries to give us as much of that as possible.